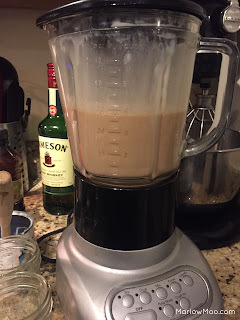 Whenever Christmas rolls around, I always enjoy pouring a little Irish Cream into a coffee to start the morning.... I won't get into the details of whether these mornings are weekdays or weekends, I'll leave that to your imagination. For later in the day, I switch to drinking Irish Cream mixed with a little milk or just straight over ice. Normally, I'm the lazy type and just buy Irish Cream from the liquor store. 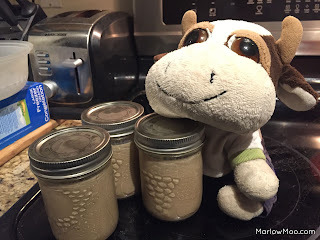 However, last year, I decided to give making Irish Cream a try and stumbled upon an Irish Cream recipe by Twyla Campbell, which was very enjoyable, although a little on the strong side for Moo to drink first thing in the morning. So this year I decided to tweak it and after some fun experimentation (hic! 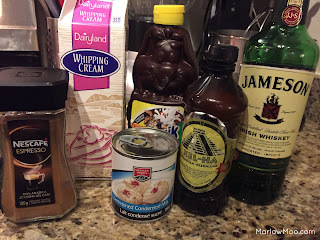 ), I’ve come up with a variation of Twyla’s Irish Cream recipe that seems to appeal to my tastes more, as well as those of my friends. Or to quote one of the male human's friends, @astrostyle, "crazy fantastic". 1. Put all of the ingredients into a blender. 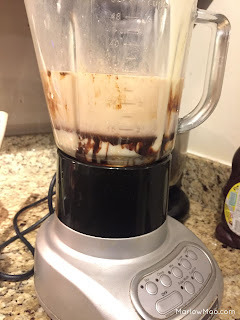 I try to put the sweetened condensed milk in last so it doesn't stick to the bottom of the pitcher. 2. Blend on low until all the ingredients are thoroughly mixed. Do not use too high of a setting or you'll start making Irish Cream butter (I made this mistake). It's still drinkable, you just have to skim the fat off the top. 3. Pour into sealable containers. I use canning jars. Makes roughly 750 ML to 1 L.
4. Store in refrigerator. Twyla's recipe says it will store for 2 months, but frankly, it's never lasted that long in my fridge cause I drink it too fast!